A new generation, quality upgrading Large Format LED UV Roll to Roll Printer MT-UV1805Plus is coming which is a dexterous, highly active, energy saving, premium industrial grade UV Printer! The MT-UV1805Plus LED UV Roll to Roll Printer adopts 4 Epson DX5 Original Top Class high speed Printheads. It contains 1440 nozzles of each printhead that is more than three times nozzle of Ricoh Gen4 printhead! Standard model use dual Epson DX5 printehads by 4 colors/5colors printing, maximize the best performance of the productivity and precise printing quality! 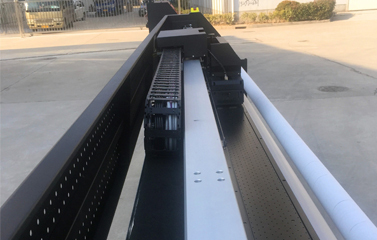 The MT-UV1805Plus LED UV Roll to Roll Printer adopts THK 20mm width Linear Guide Rail with two slide blocks that can efficiently increase rigidity and torsion resistance, higher precision and mute silence during printing process. The THK Micro Guide Rail and Screw Rod are introduced to carriage lifting system to deliver easier adjusting and higher precision printing. The New Variable Droplet Control Technology achieves precisely control each dot for beautifully sharp image and stunning seamless gradation that makes the printing more delicate and accurate. Because of the droplet size are from 1.5pl to 21pl and the maximum 1440dpi resolution help you to deliver outstanding image quality. So that, there are more detailed and smoother gradient printouts can be achieved by this technology. It means the printing quality is greatly enhanced and accelerates the printing speed too. Therefore, more and more efficient print jobs can be accomplished and satisfy even the most discerning customers, thus MT-UV1805Plus UV Roll to Roll Printer enhance the productivity! The LED UV Roll to Roll Printer MT-UV1805Plus equipped with adjustable Media Tension System. The media tighten rollers are setting both front and back of the printing machine which makes roll material smooth feeding and neat take up while the whole printing process! We adopt High Precision Platform for our LED UV Roll to Roll Printer ensures the exquisite printing. Its intensive Multi-touch Pinch Roller structure provides balance pressure to supports the roll material move forward precisely! It also can provide more accurate media feeding for wide format and continuous printing. 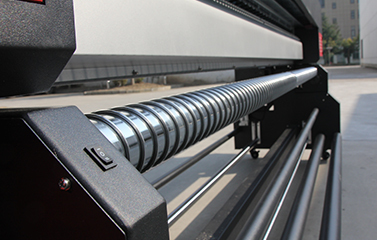 UV Roll to Roll Printer MT-UV1805Plus integrated Anti-collision Sensor in each side of printhead carriage to prevent the printhead from unexpected damage. 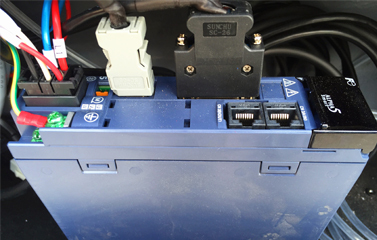 Those sensors automatically detect the printing plate or any force on the way going. It prevents any possible strike to the UV printheads. Large size LED Lighting System backlight the printed area during printing process, the printing effect and quality can be inspect immediately on MT-UV1805Plus! The LED UV Roll to Roll Printer MT-UV1805Plus equipped with 400W Original Fuji Servo Motor ensures accurate and stable X-axis motion movement. In addition, Dual Motorized Media Take-up and Feeding System for broad media choice, easily handle heavy-duty media. 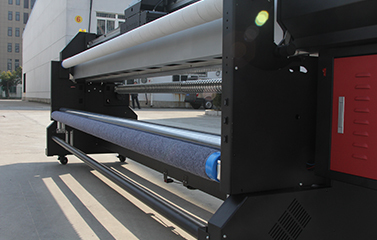 There is Platform Control System equip on LED UV Roll to Roll Printer MT-UV1805Plus that can adjust and control the suction, ensures various roll materials remain in the best condition to pass the platform surface.